FEBRUARY is Seedling Month! Clean-up, Maintenance, More Plan than Plant! This is your last chance to plant more rounds of winter veggies you love the most, and the littles that grow year round. Peas are especially heat sensitive, but we Coastie pea lovers can get one more round! At this time be sure they are mildew resistant varieties! But it’s really time to think in terms of those summer treats you love too! Space is an issue now unless you have fields! Those of us in 10’ X 20’ Community Garden plots need to reserve space and prepare those soils. I plant some of the smaller border plants, like lettuces, where they will be on the sunny side, then add the bigger plants that need more heat behind them in March. Plant LETTUCE, beets, brocs, cabbages, cauliflower, celery, chard, kale, kohlrabi, potatoes, radish, spinach, turnips. Asparagus and artichoke bare-root. Or put in asparagus from seed in March. Clean things up. Prune your trees, remove dead wood in your herbs. Divide clumps of Society garlic. On ground that needs more humus, lay down some bagged steer or well aged horse manure, let the rains wash the nutrients down, in about 2 months dig it in. Continue with your harvesting, sidedress your producing plants, do your snail prevention. After rains, foliar apply another batch of aspirin – stimulates growth, boosts the immune system, and baking soda and powdered milk to boost their immune system and act as a germicides. Don’t forget to add a dash of liquid soap to make the mix stick! Hold off on watering for a few days to let the potion do its job. Your plants will thrive! Select your plants Mindfully! This takes more than a quick trip to the Nursery and buying whatever they have on hand. But, hey, if that’s all the time you have, then go for it! If you have the time, do some quick online comparisons at Universities that specialize in Mediterranean climates. Check out this year’s All America Selections! Ask at your local nursery why the varieties they have are their choices. What pests or diseases did your plants have last year? Select for resistance or tolerance. Is that plant heat tolerant, bolt resistant? What is the disease or pest cycle? Can you plant at another time, just a few weeks later to avoid them?! Is it a long producing pole plant, or a heavy one-time bush producer? How much space will that amazing plant take up versus it’s return? Is that variety better for canning or table eating? Do you want a hybrid, or will you be seed saving and need an heirloom that plants true year to year? 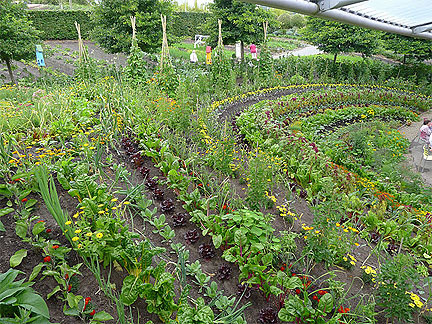 In a community garden, with all kinds of plants close together, few true seeds can be saved. Start Your Seedlings! If you have a greenhouse, and it can be a very small humble enclosure, even a row cover setup, start your seedlings now to plant mid to late March! At home? Easy! Use flats, peat pots, six packs, punctured-for-drainage plastic containers reused from your kitchen. Sterilized potting soil holds moisture and is easy for tiny roots to penetrate. Put them in your greenhouse or with grow lights 7 to 10 inches above, on 14 to 16 hours a day. Put a plant heating pad underneath, a heat cable, or a moisture protected 15/20 watt bulb in a ‘trouble light,’ for warmth, 70 degrees F. For better germination, spray aspirin on your seeds before planting! 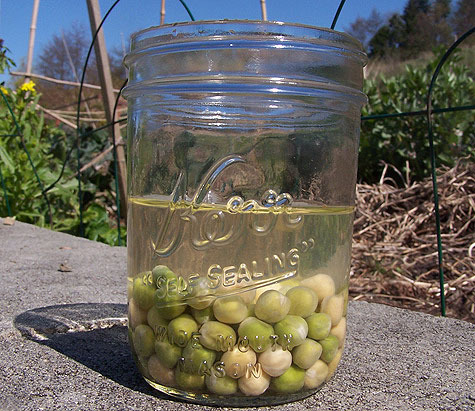 Another great trick is seed soaking and presprouting! When they are ready, let them sit outdoors in the daytime shade for a week, then in the sun for a week, then all day the 3rd week. That process is called hardening off. The beauty of seeds is you can get the very best plants, and varieties your nursery doesn’t carry! This is a great time to install native plants and fruit trees, so see if any of this info affects where and how you place them. 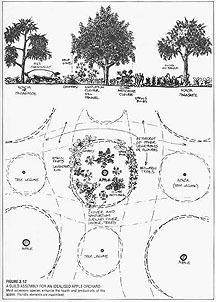 A food forest can be anchored by a south opening ‘U’ shaped planting of trees that captures heat for growing veggies in its center area. It can start with a single tree. Read Toby Hemenway’s book ‘Gaia’s Garden,’ especially the chapter on Designing Garden Guilds. Toby says “…biological support replaces human intervention, shifting the garden’s burden onto the broad back of nature.” If you have time and inclination, see Linda & Larry’s Food Forest Video! Besides their suburban Santa Barbara yard being a food forest, it is the epitome of edible landscaping! Your nursery will begin stocking bare-root trees this month! Santa Barbarans, have you heard of Norm Beard? He’s the man to see, past President of California Rare Fruit Tree Growers! You will be amazed what we can grow here, and Norm knows the varieties and stocks the ones that grow best here! *Guild plants are plants that grow well together. It’s a LOT more than companion planting by twos, two plants that like, enhance, or help each other, though that is wonderful too. Happy plants make more food! Guilds are systems of plants starting with a tree if you have the space! Check out Permies.com on Guilds If you love the idea of guilds, and apples, check out this Apple Tree Guild! – image at left. See the details at the link. A super functioning guild utilizes both vertical space and horizontal overlapping circles! 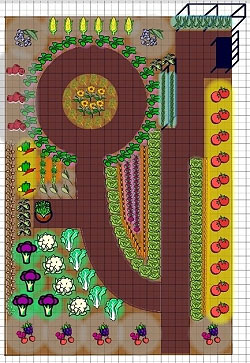 I am in hopes you will talk this up to your apartment owner, install it on your own property, model your veggie garden after it, share it with every gardener anywhere, of any kind that you know. This principle is so important in many ways. Guild lists can be made for every area, plant zone, specific for every tree! Guild planting makes sense. It’s economical. Plants grow densely, produce more. We are making on prem food forests when times are hard and may get harder. Ecologically we are restoring native habitat when we plant and support those plants that use our water more wisely. It is sustainable – produces more food on less land, cuts food miles, no fuel, packaging. Health is prime as we eat organic, much more nutritious food that hasn’t been depleted by shipping, storage and processing. Our list [SEE IT!] author is Linda Buzzell-Saltzman, M.A., MFT, co-editor with Craig Chalquist of the anthology Ecotherapy: Healing with Nature in Mind, Sierra Club Books (May 2009). She is a psychotherapist and ecotherapist in Santa Barbara, where she specializes in helping clients with career issues, financial challenges and the transition to a simpler, more sustainable and nature-connected lifestyle. Linda is an heirloom rose lover, current VP of the Board of the Santa Barbara Rose Society, founder of the International Assn for Ecotherapy and co-founder of the Santa Barbara Organic Garden Club! She cares. Linda’s List is intended for a Mediterranean climate like coastal Southern California has, one of only 5 in the world. The list in your area may be different. Check out your local gardener’s successes, check with your local nursery. This list is not tree specific yet. We’re working on that! SEE PART 2, the List! A Little about Onions, a LOT about GARLIC! Onions: Are sensitive to temperature and day length, are photothermoperiodic! Whew! They start bulbing only after enough daylight for a certain number of days. 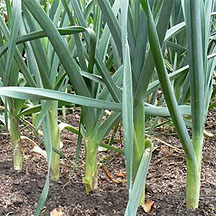 To avoid bolting, in SoCal we need to plant seeds of short day onions in fall, or intermediate varieties in late winter. Most sets are long-day types and won’t work. Plant Grano, Granex, & Crystal Wax seeds in the ground Nov 1 to Nov 10, or bare root in January. Granex stores a little better, all of them are sweet like Vidalia and Maui. If you miss this window, plant intermediate onions in Feb. Onion seeds sprout very easily! Garlic LOVERS, if your garlic plants haven’t been as vibrant and robust as these in the image, really amend your soil, put them in full sun, feed them! Sometimes add a tad boron and zinc to give them great taste! Give them ample drainage and 24” deep watering. Garlic is in the genes, I mean, the lily family, related to chives and onions. So pretty! Did you know roses make more pungent perfume, and more perfume, when interplanted with garlic and onions?! Tuck some garlic in among your other flowers and veggies, but NOT with your legumes! Like onions, garlic stunts peas and beans. Research indicates garlic aids in lowering cholesterol, reducing cardiovascular disease, cancer prevention, relieving cold and flu symptoms. Planting in the November/December will produce bigger cloves, but you can also plant garlic in the early spring – who can resist more fresh garlic?! Gilroy CA, 30 miles south of San Jose, just up the road from Santa Barbara, is called The Garlic Capital of the World! Gilroy’s Christopher Ranch was, and remains, the largest shipper of garlic in the world! Take note that the 2012 Gilroy Garlic Festival will be July 27, 28, and 29th! So their prime festival garlic roses had to be growing all winter and spring! Count that backwards 7 months, and you have a Dec planting! That means they have more daylight growing time after Winter Solstice as the days lengthen, and more growing time during warmer months! Makes sense, yes?! Garlic takes time – a long growing season and plenty of sun. Be warned that overcast coastal weather may not go well with your garlic aspirations. Also, pause, do you want to tie up that sunny land that long for such a small return? Less insects, no vampires? Ok, read on. Some traditionally plant, not in late October, early November, but on Winter Solstice, the shortest day of the year, for harvest on the longest day of the year, Summer Solstice, or in July! Your garlic will grow slowly all ‘winter,’ making huge bulbs! It likes the cooler moist weather, and freezes are good for it! You just have to be willing to feed them fat, and wait for them! Here in SoCal, why not plant some in all the fall months?! That’s three rounds, Oct, Nov, Dec! See what works best in your microniche. If some fail, you will have others! The garlic most of us are familiar with, commonly found in our grocery stores, are the soft-necked varieties, Artichoke and Silverskin, grown in milder climates with longer days. California Early and California Late varieties need cold exposure of around 6 weeks below an average of about 40F for proper bulbing and clove development. It is the classic, white skinned ‘artichoke garlic’ of the supermarkets. Continental garlic is more of a generic term covering various white or purple striped hard neck types adapted to more Mediterranean growing conditions. That’s us. Garlic needs choice generously amended nutritious soil, to be watered deeply, 24”, in fact! Garlic World, at Gilroy CA, says garlic needs twice as much fertilizer as other veggies! And they need feeding during growing. Visualize those hungry bulbs underground. Heavy soil restricts their growth, so you want rich, loose – not water-logged, fertile! When you drive through garlic growing country you can SMELL them! That’s how alive they need to be! The bigger the seed/clove, the bigger and healthier your plant will become, so plant the huge cloves, reserve the smaller ones for eating and seasoning! Divide them just before planting. Plant pointy end up, 2” deep, 4” apart. Some people plant them 6” deep, others plant them just under the surface. I’ve had them grow both ways, but to keep the bulbs moist and happy, it makes sense to give them at least that 2” depth. When the tops start to fall over, stop watering, let the smelly little guys dry a week or two, still in the ground. Clever harvesting means to carefully loosen the soil with a spade fork, and not bruise the bulb when you remove it. Let it dry some more in a shady airy place 2 to 3 weeks. RECIPES? Fries, ice cream, pasta, sauces, soups, salsa, dips, bread, gift braids, pickled, jellied, roasted, cheese, dressings, potatoes, hummus, powdered. Garlic cookies?! At your pleasure. Confessions of a Garlic Festival Food Judge If you both love garlic, know that a couple can celebrate their anniversary by sharing the Forty Clove Garlic Chicken at The Stinking Rose in San Francisco or Beverly Hills! Next Week: Delicious December, Winter’s June! Mulching, Composting in Place – Some Like it HOT! I used to be a total mulcher, covered my whole veggie garden. I’ve adjusted my coastal SoCal mulch* thinking to match the plant! Same goes for composting in place. That’s a good idea for some areas of your garden, other areas not at all! If you are coastal SoCal, in the marine layer zone, your mulch, or composting in place, may be slowing things down a lot more than you realize. The best melons I’ve ever seen grown at Pilgrim Terrace Community Garden were on bare hot dry soil in a plot that had a lower soil level than most of the other plots. The perimeter boards diverted any wind right over the top of the area, the soil got hot! It was like an oven! So, let it be bare! No mulch under melons, your winter squash, pumpkins except under the fruits to keep them off the ground, clean, above soil level insects. For more heat, put up a low wind barrier – straw bales, a perimeter of densely foliated plants, a big downed log, be creative. Permeable shrubs are the most effective wind barriers. Let your peppers and jicama get hot! Eggplant are Mediterranean heat lovers! Okra is Southern, hot. Tomatoes need dryer soil to avoid the verticillium and fusarium wilt fungi, no more than an inch of loose straw to allow airflow at soil level but keep heat down. Let ‘em dry nearby; water a foot or more away from the central stem. Let that tap-root do its job, get the water below the fungi, wilt/blight zone, the top 6 to 8 inches. Drier soil is not comfy for slugs. Get cucumbers up on a trellis, then you won’t need mulch to keep the cukes clean and bug free, but rather because they have short roots. Preplant radish to repel cucumber beetles when your cukes bloom. The radish will provide a living mulch as their leaves shade the cuke roots. Eat a few radish, but let the rest grow out to keep repelling the beetles. In time you can gather their seeds. 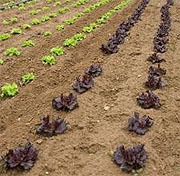 Plant heat tolerant lettuces at their feet to act as living mulch. They both like plenty of water to keep them growing fast and sweet, so they are great companions. Slugs and snails like peas and lettuce. You will need to use a little Sluggo or its equivalent if you feel comfortable to use it. Clearly, no mulch, more heat, equals more water needed. In drought areas, plant in basins below the main soil level. Use your long low flow water wand to water only in the basin at the roots of your plant. Fuzzy leaved plants, tomatoes and eggplant, prefer not being watered on their leaves anyway. Since there is no raised mound, there is no maintenance needed for berms surrounding the basin, but you will need to keep the basin from filling in. Plant companion littles and fillers in the basin around the base of bigger plants. They will enjoy the cooler damper soil and provide living mulch to keep that soil more cool! LIVING MULCH is triple productive! It mulches, provides companion plant advantages, and is a crop all at the same time! Closely planted beets, carrots, garden purslane, radish, turnips act as living mulch to themselves and bigger companion plants you plant them by. The dense canopy their leaves make lets little light in, keeps things moist. Cucumbers under broccoli are living mulch while the brocs repel cucumber beetles! If you cage or trellis your beans, most of the plant is up getting air circulation, keeping them dryer, more mildew free, if you don’t plant too densely. They, cucumbers and strawberries, also have short feet that need to stay moist, so do mulch them – your beans and cukes with clean chop and drop, straw or purchased mulch. Zucchini, doesn’t care. They are a huge leaved plant, greedy sun lovers, that are self mulching. But, you can feed their vine up through the largest tomato cages, cut off the lower leaves and plant a family of lettuces, carrots, onions, salad bowl fixin’s or basil on the sunny side underneath! Especially preplant radish to repel cucumber beetles! All of them like plenty of water, so everyone is happy. Cooler crops, over summering Broccoli, Kale, Chard like moist and cooler, so mulch deeply very early in spring. Boards as mulch! Your strawberries like slightly acidic soil, and acidic mulch – redwood or pine needles. Also, you can lay down boards between mini rows of strawberries to keep the soil moist under the boards, the soil between the rows that the berry roots have access to. It’s a variation on pallet gardening. The advantages of using boards are you can space or remove your boards so you can easily access the soil to add amendments, you can add or remove boards to make a bigger or smaller patch, you can make the boards the length you need or want, space them as needed per the plant. Planting between boards can be used for lots of other plants too if you won’t be planting an understory! As for your strawberries, as they leaf out and get bigger, in addition to the boards, they will be living mulch for themselves! If you are going to mulch, do it justice. Besides wanting to cool your soil, keep moisture in, prevent erosion, keep your crop off the soil and away from bugs, and in the long-term, feed your soil, mulching is also to prevent light germinating weed seeds from sprouting. Put on 4 to 6 inches minimum, tomatoes being the exception. Less than that may be pretty, but simply make great habitat for those little grass and weed seeds! Mulch makes moist soil, where a rich multitude of soil organisms can thrive, including great fat vigorous earthworms! You see them, you know your soil is well aerated, balanced, doing great! Mulching is double good on slopes and hillsides. Make rock lined water-slowing ‘S’ terrace walk ways snaking along down the hillside. Cover your berms well and deeply to prevent erosion and to hold moisture when there are drying winds. Be sure to anchor your mulch in windy areas -biodegradable anchor stakes are available. Carolyn Csanyi has some clever ideas on how to keep your mulch on a slope. 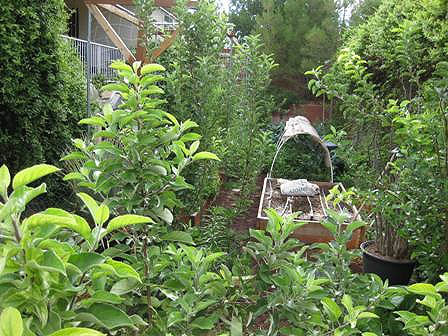 Plant fruit trees, your veggies on the sunny side under them, on the uphill side of your berms. Make your terrace wide enough so you don’t degrade the berms by walking on them when you harvest. If you mulch, make it count! Mulch with an organic degradable mulch. Chop and drop disease and pest free plants to compost in place, spread dry leaves. Spread very well aged manures. When you water, it’s like compost or manure tea to the ground underneath. Lay out some seed free straw – some feed stores will let you sweep it up for free! If you don’t like the look of that, cover it with some pretty purchased mulch you like. Use redwood fiber only in areas you want to be slightly acidic, like for strawberries or blueberries. COMPOSTING IN PLACE Build soil right where you need it. Tuck green kitchen waste out of sight under your mulch, where you will plant next. Sprinkle with a little soil if you have some to spare, that inoculates your pile with soil organisms; pour on some compost tea to add some more! Throw on some red wriggler surface feeder worms. Grow yarrow or Russian comfrey (Syphytum x uplandicum) near your compost area so you can conveniently add a few sprigs to your pile to speed decomposition. It will compost quickly, no smells, feeding your soil excellently! If you keep doing it in one place, a nice raised bed will be built there with little effort! You don’t have to wait to plant! Pull back a planting space, add compost you have on hand or purchased, maybe mix in a little aged manure mix, worm castings, your favorite plant specific amendments. Sprinkle some mycorrhizal fungi on your transplant’s roots (exception is Brassicas), and plant! Yes! *Mulch is when you can see distinct pieces of the original materials. Finished compost is when there are no distinct pieces left, the material is black and fluffy and smells good. Mulch is magic when done right!